This Dōmaru armour with Kabuto helmet was made in the 19th century for a member of the Hayashi clan, who had only recently moved into the ranks of the Daimyo (princes, local rulers) in feudal Japan. From the 17th century to today, the Hayashi clan still play a significant role in Japanese culture. The Kris, a ritual dagger with asymmetrical blade, is common in Indonesia, Malaysia and the Philippines. Because of its spiritual significance, it was declared by UNESCO as an intangible cultural heritage of mankind. The Kris is a type of blade used as a ritual weapons from the Himalayas. 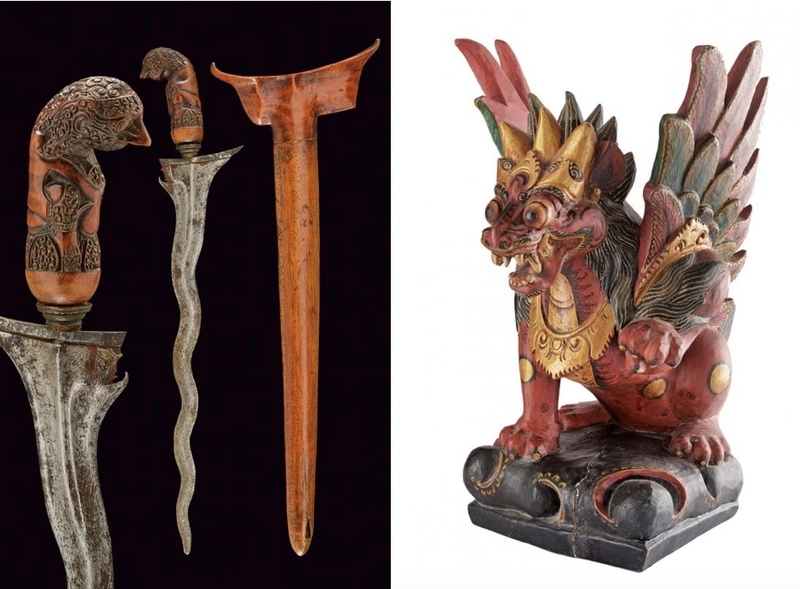 Its function in religious rituals is indicated by the dagger by the shape of its handle as it has the form of a Vajra, a Buddhist ritual object. The right-hand object in the form of a stylised rhino head is a Ram Dao. These temple swords were used for sacrificial rituals. 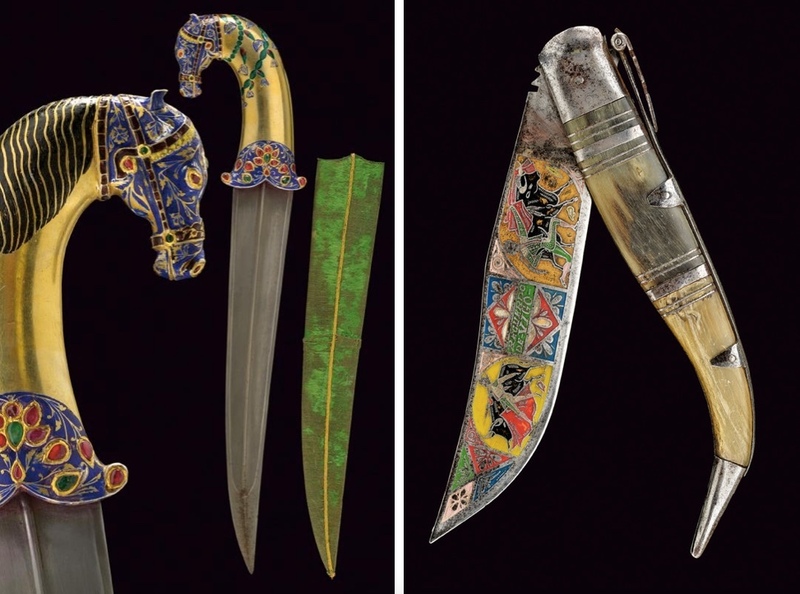 Two colourful weapons with a short blade from India and Spain can be seen here. 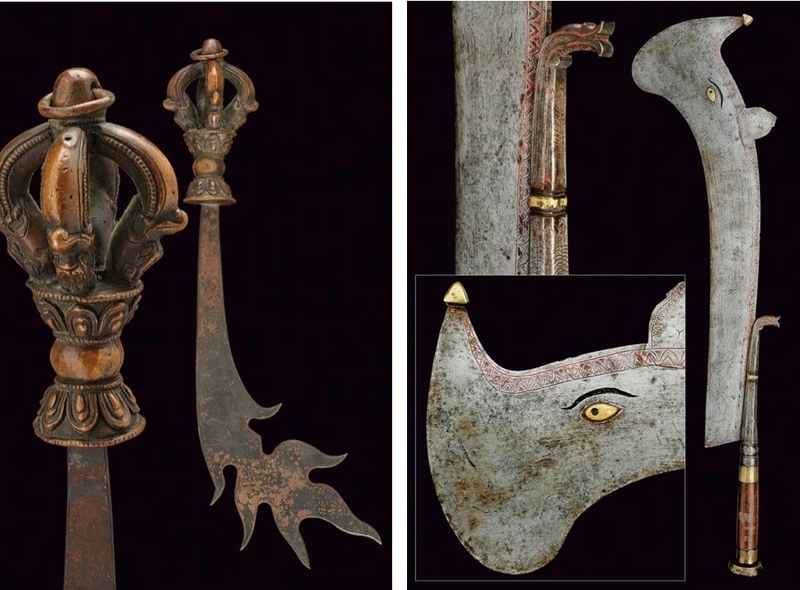 The dagger from India has a handle in the form of a horse head with enamel decoration. Its wooden sheath is covered with green velvet. 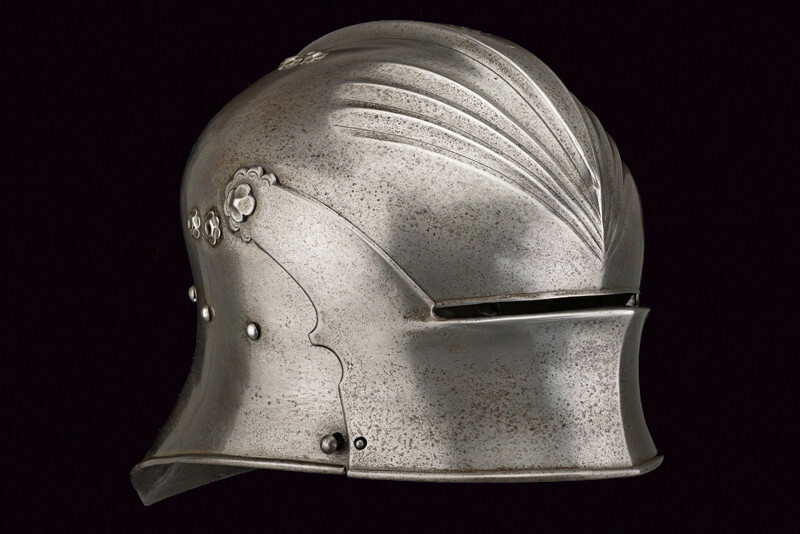 This late medieval helmet comes from the collection of Munich painter Rudolf Kuppelmayr. In 1888 he inherited the art collection of his father, the architect Max Kuppelmayr. The helmet is a 'switch,' which had only been developed from the "Eisenhut" at the beginning of the 15th century. 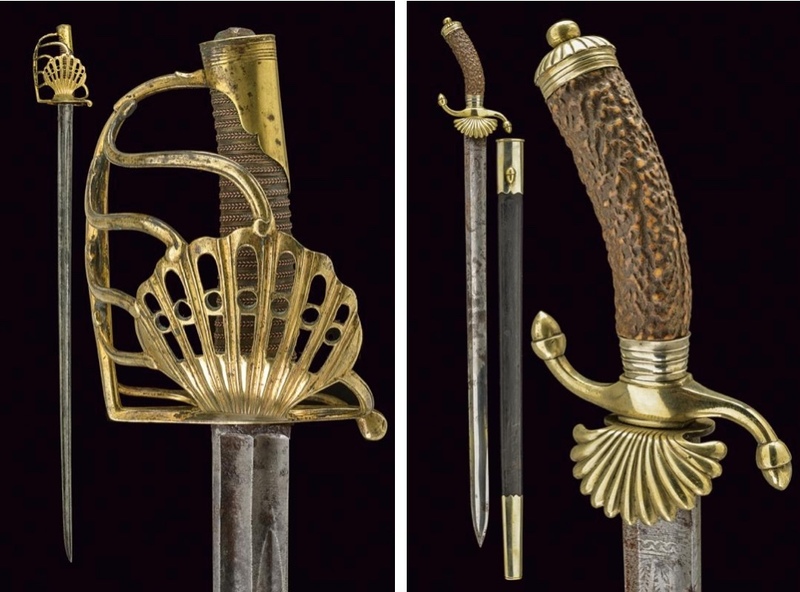 Left:Saber with "Garde de Bataille", France 1st quarter of the 19th c.
Right: Hunting knife, Germany 19th cent. 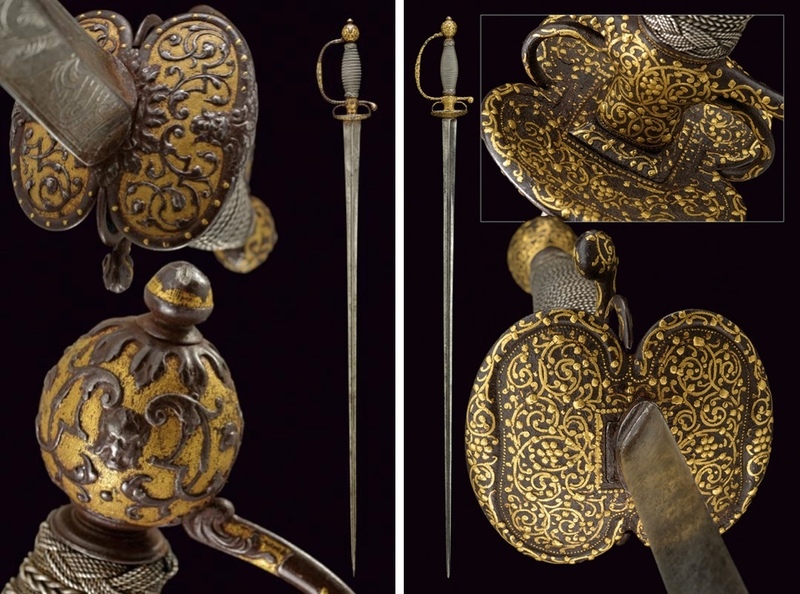 Right: An important short sword with floral decor, Germany middle of the 18th century. Wearing a sword was once the privilege of the nobility. The Palace of Versailles was once open to every citizen of France with the condition was that the visitors were neatly dressed. This included wearing a court robe. Gentlemen, who were not part of the moristocracy, were able to borrow a copy a court robe the entrance of the castle. The auction will take place on the June 10 at Czerny's auction house in Sarzana, Northern Italy. Check out the full catalog here.